You think you have seen some shocking and killer selfies, wait till you see this one. A couple poses for a regular selfie but the outcome is freaking the whole internet. 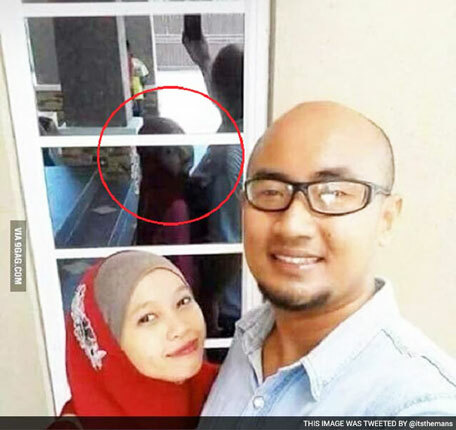 It may take a second to sink in but look beyond the couple and focus on the window which acts as the background for their selfie. See that face looking at you from the window? That's the reflection of the woman staring into the camera. But wait. It should be the back of her head reflected on the window pane and not her smiling face, right? That's science, that's what we were taught in school. But here the smiling woman is facing the wrong way (maybe right way, or maybe both). We are not sure if this is an altered image, but it seems fairly candid... and ghostly. The picture, originally posted to the photo sharing website 9GAG, was shared by a Twitter user with the caption: "What kinda devilish thing is going on?" Some 17,000 retweets later, the people of Twitter responded with a bizarre array of reasons for the weird photo perspective. Suspicions jumped from allegations of Photoshop use to possible paranormal activity, and a surprising number of Harry Potter's Lord Voldemort appearance suggestions. But mostly people were just extremely unnerved by this image, so are we.